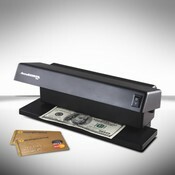 The same counterfeit fighting technology used by banks for years is now available for small business. With a total of 12 watts of UV power, this money detector is strong enough to work under any condition. Compact and portable, the D62 has a powerful ultraviolet light detector built in and it is quality assured witha three year warranty!